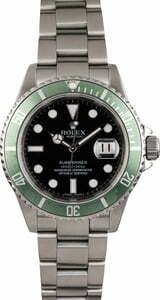 In the mid-2000s, Rolex released an anniversary edition of the Submariner diver's watch via the ref. 16610V. Also referred to as the "Kermit", the ref. 16610V is characterized by a Maxi dial with larger hour markers and hands in white gold surrounds as well as a striking bezel insert in the brand's signature green hue. 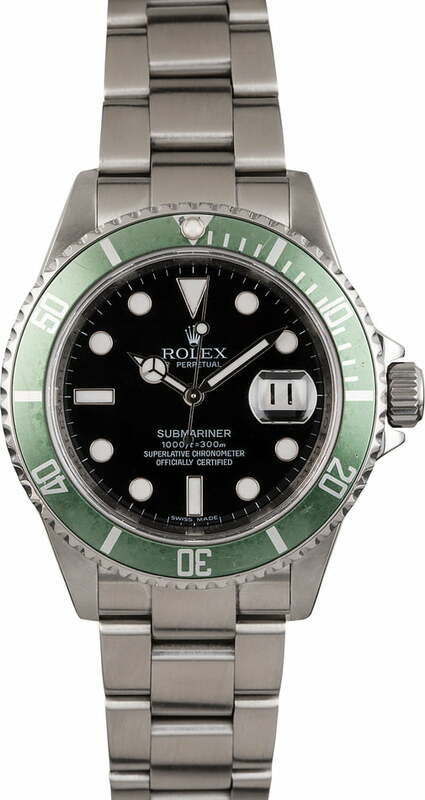 This variation of the Submariner is a popular choice among pre-owned Rolex collectors as it offers a desirable green bezel without appearing too flashy. The ref. 16610V also boasts the line's standard depth rating of up to 300 meters as well as a unidirectional 60-minute bezel and a 40mm Oyster case.